Humans and dogs began their long association with one another tens of thousands of years ago – you might say our two species have ‘grown up together’. We and our dogs are in a symbiotic relationship called mutualism; one where two species interact to the benefit of both. To a great extent, the relationship between dogs and people is probably the most mutualistic on earth, even the close ties between humans and cats fall short when compared with humans and dogs. Dog lovers will not hesitate to tell anyone who will listen how wonderful their own dogs are and how great dogs are in general, but as it turns out, there are actual health benefits that accrue from having a canine or two in your life. Whether you have a pure breed dog or a mixed breed, it doesn’t matter – dogs are just good for us, no matter their genetic background. All of us who own dogs understand the love and devotion our dogs give to us unconditionally every day, which we should return to them, but interacting with dogs can provide health benefits for every member of the family. Dogs may be the best way to help prevent and treat some of the medical problems that can beset us. Asthma is nasty respiratory disease where the airways in the throat and lungs swell and narrow, making it hard to breathe. The number of people who have asthma is rising, and most of those afflicted are children. Allergies are often responsible for triggering an asthma attack. Fortunately, it’s been found that dogs may help to prevent asthma from developing, especially when dogs are present from the time of a child’s birth. Dogs might be said to be a bit untidy, but it’s this untidiness that actually works to the benefit of children – being exposed to dogs ramps up a baby’s immune system so that it is better able to resist not only disease, but it also becomes ‘hardened’ to substances that might cause allergies and asthma. 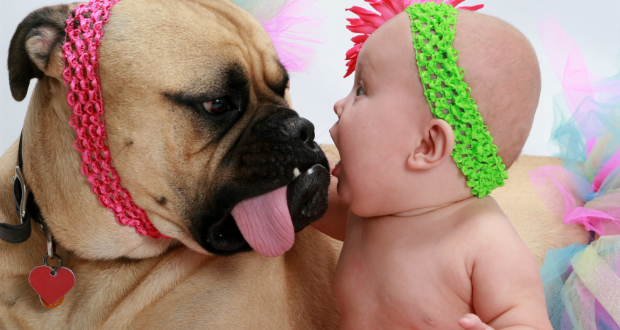 A child’s chances of staying free of asthma and allergies rises to over 30% when a dog is a household member.